As we depart Greece it’s time to reflect on this historic country and look back at what kept us here for so long. I hope this gives you a sense of what Greece has been like for us through the eyes of two Kiwis with little initial expectations or knowledge about this country, other than a week in Corfu twenty something years ago. On first impressions, driving through from the Albanian border into Greece in September we found ourselves on a stunning new (toll free) motorway that appeared to have been smoothly paved just for us. It was easy to see where the EU money had been spent. However, there were virtually no other cars around despite it being still warm and only just nudging the end of the tourist season. The countryside was dusty dry, with brown tuffs of what used to be grass all around us. It looked like it would crunch under your feet should it be walked upon. It didn’t take long for the countryside to change through the season as we spent the winter months touring all over Greece. Here’s the summary of our experiences with this historic country. Months of the Year 2nd December 2017 – 24 March 2018 - our blog is based on this time. There are so many wonderful things to say about Greece that it’s difficult to know where to start. However let me kick off with the people; they are outstandingly friendly and love to enquire as to where we are from. Ply them with a few drinks of Ouzo and you have a friend for life! We sat one night on a beach with a father and son and offered them Ouzo to keep warm (it was winter after all and the son was an adult). The stories flowed and we soon discovered they had just lost their mother and wife and were out looking for some bonding and reflection time together. One thing that intrigued me about the people in general that are out and about, is the lack of women seen in public. We often saw groups of men, sitting outside or inside Tavernas (Greek for taverns) having a few drinks, laughing, playing cards, smoking, or just chewing the fat with their friends. The cafes were the same, from a couple of men, to a table full of men eating and drinking. But very few women! Where are they all? Another pastime we noticed, again by the Greek men, was fishing. We often parked near the oceans edge on piers or just simply on the side of the beach. Inevitably there would be at least one man sitting on an upturned bucket or old rickety seat with fishing rod in hand. He would sit there for hours and hours on end. Oftentimes the spoils were few and far between due to the over-fishing of these waters for many years. At times we would offer a conversation and/or drinks, taking them tea or Ouzo depending on the time of day. In return we enjoyed fresh fish and calamari as well as Greek fishing lessons for Alan, which resulted in some tasty dinners for us both. While on the subject of the ocean, I would have to mention how crystal clear the Mediterranean is in this part of the world. It wasn’t something we expected, and certainly in the south the waters sparked clear showing off its schools of small fish. A lonely turtle was even seen diving around the harbour at Monemvasia. The beaches ranged from nice white sand, through to large pebbles, and rocks! The next positive point to mention has to be Greece’s rich and stunning history . We didn’t expect to be visiting castles, archaeological sites and museums quite so much as we did, and we certainly visited our fair share. I must confess, rather self-consciously, to knowing very little about history, let alone Greek history. It had never really interested me in school or as an adult. However if any place is going to change that, it has to be Greece. The history lessons are everywhere for example in the construction techniques of the castles where the various styles of Venetians, Ottomans, Romans, and sometimes the Franks could be clearly identified over the centuries during whichever force was then occupying Greece. Talking about construction, we also learnt to distinguish between Doric and Ionic columns, plus Corinthian columns. Then there were the different styles of walls, buildings, and of course houses. I think I could almost tell you who was ruling in certain regions, due to the road construction still seen today. One couldn’t think or write about Greece without mentioning olives. The trees are everywhere, and I mean everywhere. Plantations can be seen literally on the side of steep cliffs high up in the mountains, as well as right down on the plains and close to the ocean. I heard someone suggest one-quarter of Crete, the island at the bottom of Greece, is planted in olive trees and given it is the third highest export, behind petroleum (number one) and medications (number two), it wouldn’t surprise me. So what else kept us in Greece for such a long period? It has to be the weather. In fact as I start to write this, we have just crossed over to Italy where it’s raining and cold. We went from a balmy 24 degree high in Crete last week, to an overnight temperature of just 5 degrees Celsius last night in Bari, Italy. The weather in Greece didn’t fail us. We experienced a light dusting of snow in Thessaloniki in the north, a couple of days before Christmas and that was the coldest we felt (about zero overnight). Even this was not cold enough for us to need our heating on all night. Then in Pylos we experienced a once in five year storm, which provided some great pictures as the waves crashed over the pier high enough to cover third story apartments. Christmas day gave us a very mild 15 degrees and from here as we headed further south the good weather followed. At one stage it was touch and go as to whether or not we would see Meteora due to its high altitude and snow, however the weather gods were with us, and the magic of this place wasn’t hidden, nor was it missed. Betsy, our Motorhome, doesn’t have snow tires or chains, so we had to be mindful of driving conditions in the winter months. That was never an issue as we headed further south to the Peloponnese region and even less so in Crete, where the warmth was immediately obvious. We were told to expect fresh beautiful produce in Crete at this time of the year and this was certainly the case. The citrus fruit was abundant and vibrant, (not to mention free and some, like the lemons, were even at Betsy driver’s window height and reach at times), the tomatoes tasty and the aubergines perfect. We made the most of this wonderful resource and not only was the fresh produce beyond our expectations, but the cost of eating, or buying food to cook ourselves was incredibly inexpensive. One thing I noticed that was different to home was that a grocery store often didn’t sell fresh bread as there was often a bakery within 100 metres down the road. Sometimes the fruit and vegetables were limited in the supermarket, especially the smaller ones because there would be a green grocer nearby and the local butcher was also just a few doors down. I understand that this keeps the local producers in business and I liked that we get three or four opportunities to talk to and meet the locals. In saying that, the language barriers were interesting and their language not the easiest to learn, let alone their alphabet and even a simple act of trying to sound out the word was near impossible when you see the Greek alphabet! Another good point about Greece is the vast amount of attractions to visit. There seems to be no end of opportunities to visit tourist type destinations, like the caves at Diros, the Crete Aquarium in north Crete, literally hundreds of archeological sites, castles, fortresses and not forgetting the acropolises. Some are free of charge like the hot thermal stream we came across in Thermopilion and the world’s supposedly oldest olive tree in Crete. When travelling in the off season many of the entrance tickets are reduced by 50% or they just leave the gates open and you can enter for free. The scenery varies widely throughout Greece, from tall mountains, rock formations, caves, beautiful sandy beaches, green rolling paddocks, dusty dry paddocks and stunning mountain vistas. One of my personal favourites when it came to scenery was the waters around Vourvourlou in the northern part of Greece in the Chalkidiki Peninsula region. Being a Cancerian, the star sign of a crab, I am naturally drawn to the water, however I also cannot overlook the absolutely stunning mountain scenery of Meteroa where Monasteries were built thousands of years ago literally on top of tall skinny rock formations and they are still standing today! To read more about this stunning location, see our Meteora post. Another plus for me personally, is the cats in Greece. They are adorable, cuddly, and mostly friendly. We miss our cats from home so having the opportunity to enjoy these feline friends was a bonus. Last but not least is the cost of living in Greece. I suspect that you would struggle to find cheaper living anywhere else in the EU or Schengen countries. We met a chap from another part of Europe who had rented a house for the winter at one of the lovely beaches in Crete and said he was paying €200 per month for the pleasure. I don’t know how big it was or how many bedrooms, however, I figure that’s a pretty decent figure. If you wish to find a place to sit, relax, soak up the culture and sun, and not have it cost you the earth, then look no further. It’s definitely one of the pluses of Greece. When thinking about the ‘bad’ I have included the maintenance, or lack thereof, that is particularly evident throughout Greece. I am talking about maintenance of buildings, roads, pavements, and local facilities like water taps. While I say this is bad, I would actually rather put this in the ‘sad’ category (if I was to write one). The interesting thing is that if basic maintenance is overlooked for too long, the cost becomes more expensive, i.e. replacement of lampposts are expensive, whereas painting them to prevent the rust happening would have been a cheaper option. However, the fiscal purse strings and their priorities must be a real headache for those governing and charged with this responsibility. Glad it’s not my job. It would have been interesting to see Greece before this country was swallowed up in the financial crisis as I think it would have provided an additional layer of harmony to this lovely country. The lack of money doesn’t just extend to the local government’s purse, as there are several partially privately built homes that have simply been abandoned in the midst of construction. Some have been weathered and starting to fall down, others have trees growing through them, whilst others have been tagged with graffiti. This too best sits in the ‘sad’ category. The parking lines mean nothing, zilch, naught, nada. At some time, in the deep distant past they were painted on the ground as decoration or to use up excess white paint leftover from something else important. Now there is just the faint vestige of colour to indicate that there is supposed to be some order to the parking. Cars can park on the footpath, (people can then happily walk on the roads, not that they need an excuse) and there’s never any hurry or urgency to get off the road. Parking can happen in any direction also which is handy when you have one of those tiny “Ka’s” or “Smartcars”. You can park parallel, angled (in parallel spots), head on, nose in, back in, on a pedestrian crossing, the curve of a corner, or just double or triple park alongside other cars providing you put your hazard lights on as this indicates a legitimate car park! You soon discover this is only bad until you need to do the same thing yourself, and then you are grateful for those who pioneered this phenomenon before you. It would be remiss of me to mention parking without delving into some of the finer points of driving. In Greece the road speed limits are purely a guide. They don’t have any legal ramifications at all. And overtaking must, and I mean must only be attempted when approaching a blind corner on a narrow windy road. Passing on long straight roads with kilometers of visibility is to be discouraged otherwise you may lose your Greek identity. Making an extra lane when there isn’t any is encouraged as is under-passing (passing on the blind side). If you travel slowly then driving on the shoulder is for you so you can allow the oncoming vehicles to pass safely while overtaking on a blind corner in the pouring rain at speed. It’s also a national sport to see how close you can cut into the vehicle you’ve just passed without hitting them. The closer you get the higher the score. Other than that, the driving and parking is perfect in Greece. Next on my list is the Rules – or lack thereof. Now when writing this I didn’t know if the lack of rules should go in the good or bad category. So the jury is still out, keep reading and see what category you would put this into. When we talk about lack of rules we often refer to the signposts that tell us what we can or cannot do. For example, the ‘No Parking’ sign seems to encourage people to park underneath or near it. The ‘Stop’ sign at an intersection actually means just slow down and give way, there’s really no need to stop if you don’t want to. Or perhaps you can just park under it. Who said you can’t park near a stop sign?? Then the solid double white lines on the road don’t actually mean no passing, they just mean pass more quickly and cut in sooner than otherwise acceptable and that cars coming the other way should be driving over on their hard shoulder to give you room. The use of mobile phones while driving I believe is normally a no-no in most countries, however in Greece the rules don’t apply. In fact the best time to use your mobile phone is when riding your scooter with trucks traveling towards you at speed head on, and as the rider you keep both your hands on the phone! I kid you not. In fact we had this recorded on dash cam and unfortunately I didn’t keep the footage before it got overwritten. Can you imagine our horror seeing the person on the scooter traveling at 50kms with no hands steering it and no eyes on the road or on other traffic. Scary stuff! While still on the subject of driving, we anecdotally heard that a driver’s license in Greece is unofficially optional. When having a collision with another vehicle, it’s a rarity to find the driver actually licensed. This makes for an interesting insurance claim. I’m grateful we didn’t get to experience this first hand. One of our favourite ‘no rules’ is that it seems as if motorhomes can park and camp overnight wherever they like. We were there in the offseason and during the summer it is no doubt not so easy, however we used this non-rule our advantage when wild camping most nights. Given how beautiful the scenery is throughout Greece, to be able to stop and camp with the ocean outside our door every morning enjoying million dollar views was absolutely priceless. Back home in New Zealand, people would literally pay top dollar to see the views we woke up to every morning. Ruins are everywhere and we love that they remain original. I hope this ‘no rule’ rule is never rebuked, as it’s one of the attractions of Greece, in my humble opinion. The last ‘bad’ item on my list is another one for the ‘sad’ category. And that is the high taxes imposed on those running businesses. I say this is bad and sad because I am guessing that this is a symptom of the financial crisis and the controls imposed by the organisations who have lent Greece so much money. The VAT tax in Greece reaches a high of 24 per cent on some purchases. Therefore it’s no wonder that many companies run cash businesses and offer lower prices for cash. It’s good for the purchasers, but doesn’t help the economy or the government to get back on their feet quickly. Other taxes are not exempt, for example income tax, company tax and road tolls (another tax) are all very high. We wonder how the locals afford to drive on the motorways as these are the highest tolls we have come across to date. When walking down the street of one unnamed town, we saw a sign on the shop door of a hairdresser saying “closed due to tax fraud”. The government authorities obviously caught up with this business owner. Interestingly this sign was in English as well as Greek. That’s it for my ‘bad’ list. Before I tell you what’s on my ‘ugly list’ I want to share a true story. I mentioned to a fellow motorhome owner that I was writing this story and the first question was ‘what is the ugly?’. I was surprised that someone would jump straight to the ugly. Is this human nature? Are we curious, or do we just like to get into the dirt immediately? This threw me a bit because there are so many good items on my list that I would rather have shared, but this camper didn’t want to know about them. Now that I’ve kept you in suspense long enough here’s my list of ugly for Greece. That’s it; rubbish is the only thing that made it onto my ugly list. Let me explain. In fact pictures show a thousand words. It was sad to come across this in such a beautiful location. So we decided to do something about it, instead of just grumbling. Here we are in the most angelic spot of Greece, the Chalkidiki Peninsula and we came across this mess. In looking through the rubbish it actually appears to be left by someone camping. Is this the work of locals camping or tourists? I don’t know and I don’t want to guess. And that started our mission to collect other people’s rubbish from the area around where we stayed for the night. However the beautiful beaches of Greece are also littered with rubbish with the biggest culprit being plastic bottles. I know this is not a surprise to many, especially to those working with or supporting the organisations who make it their business to rid the world of plastic. We made it our mission to clean up wherever we stay. Before we leave an overnight location we collect at least one rubbish bag full of garbage and deposit it in the local nearby bins. What’s interesting is that there are ample bins around Greece but yet rubbish doesn’t find its way into them. We shared this on a couple of Motorhoming Facebook pages and were overwhelmed with the support we had from fellow motorhomers. I have another solution to the rubbish problem in Greece and that is EDUCATION. At school in New Zealand we were taught to be a “Tidy Kiwi”. This instilled national pride into the country and forty years later it has stayed with us. I suggested on my Facebook post that instead of children selling chocolate to raise funds, I propose we pay them for every bag of rubbish they remove from the beaches and parks around their area. This is a win/win solution as it will also bring awareness to the issue of unsightly rubbish and hopefully prevent these children from becoming offenders in the future. During our time in Greece, 112 days, we spent €295.39 per week. This was made up of an average €92.31 per week on groceries, €5.19 on lunches out, €11.61 on dinners and €4.21 on food, which is basically street food. Our grocery budget included cat food, not for our cat (we don’t have one) but for many strays we encountered as you saw above. The grocery total excluded alcohol which was recorded separately. The entertainment/attractions budget had us investing €165.50 (€41.37 per week) on our (my) history lessons. This weekly figure didn’t include maintenance on Betsy, our Motorhome. Our travel costs were €40.50 per week, which included among other things the cost of traveling to and from Crete by ferry. The trip over on 6th February 2018 from Githio to Kissamos cost €232 and returning on 22nd March 2018 to the same port, the cost was €202. If I was to extrapolate all the above costs to a monthly figure, we are looking at roughly €1,290 per month, (€300 x 4.3 weeks per month). This sits at the lower end of an expected €1,200 – €1,500 per month that many people reportedly budget on for typical monthly living expenses while touring in a motorhome around Europe. Below are the various locations where we visited in Greece during the months of December 2017 to March 2018, roughly in the order of our stay. Our first time in Greece was to go sailing around Skiathos and Skopelos in September 2017. We have GPS coordinates and motorhome service details for each location, which we are happy to share on an individual basis. Please feel free to drop us an email should you be interested in this level of detail. * Depicts favourite places that are un-miss-able! Meteora is one of those places in Greece that simply takes your breath away. We were told that we had to visit this place and it did not disappoint. The road to the area was unexpectedly long and wound through some semi-alpine areas with extensive snow on the ground in the late December. Parts of the road were great, other parts were narrow and rutted. Pretty typical for Greece really. On arriving in the Kalabaka, the largest town in the region, the spires of ancient rock that mark this area towered over us. We wound through the narrow back streets, and there was a feeling of quiet anticipation while following Emily (our Garmin) to the GPS coordinates of a parking spot some other generous travellers had provided. The evening was drawing in as we came around the last corner and spied the gravel parking area dwarfed by two mountainous rock pillars crowned with monasteries bathed in the last of the wintery sun. We were both rather spellbound at the magnificence and wonderment of the vista. Beautifully constructed stone monasteries perched over sheer cliffs at the top of the world. How did they build these so many hundreds of years ago without modern equipment and technologies? What devotion to their cause or God compels people to spend their lives, or even generations of lives, building these testaments to their faith? The thought that we would be sleeping under their watch and waking up to this in the morning was rather exciting. After positioning Betsy on the most level spot we could find, we hurried off to enjoy our first close up experience of a Meteora monastery. On exiting Betsy we were met by a small dog who seemed to adopt us during our stay. With little encouragement from us, she stayed nearby, slept on the ground outside Betsy and trotted alongside as we explored the area. She didn’t bark once and just seemed content with even the small morsels of attention we threw her way. The Agioi Pantas also known as Varlaam Monastery was the closest monastery to us and the light was already beginning to fade as we walked up the road and through the gates, but we couldn’t help having a quick look before coming back the next day. This brief exposure whet our appetite for the day to come. The rocks of Meteora are weathered sandstone spires reaching over 600 metres from the valley floor. Their unique shapes were formed as a result of earthquakes and weathering over 60 million years. Local myths and legends indicate that hermits dwelled among the inhospitable rocks and caves from the 9th or 10th centuries in an attempt to leave behind the morally corrupt world and unify with God through meditation and prayers. The vertical cliffs of Meteora were regarded as the perfect place to achieve absolute isolation, to discover peace and harmony, and seek spiritual elevation. The first church, dedicated to Theotokos, was built around the early 12th century as a place where the devout could worship together. From here on a more organised and unified monastic way of life developed, culminating in the construction of the first monasteries in the 14th century. Ultimately 24 monasteries were built however just six remain operational today. The Meteora area is second only to the Athos Peninsula in the Halkidiki region (a place we particularly love) in importance to the monastic orders. The next morning, we both rose early to see the sunrise. The gentle morning light playing on the golden stones, the distant snowy peaks, and the surrounding mountains were stunning. We shot off photo after photo as the early sun rays bathed first the Holy Monastery of Varlaam and then the Holy Monastery of Transfiguration of Christ or Great Meteoron, initially with a soft pink hue, then a golden glow. As the sun gradually crept across the valley floors, the photo shooting fingers continued to fire which led to a lot of culling and photo editing in the days to come. The path to the Varlaam Monastery winds back and forth, across and up the cliff face. Originally the monks accessed the monasteries using rickety wooden ladders (they had to jump from one to the other) or winching each other up the cliff face in nets, so a steep climb up a path didn’t seem too much of a hardship. This monastery was named after the first inhabitant of the rock who built three small churches, a water tank and a cell (where the monk would sleep and pray) around 1350. After his death, the rock was abandoned for about 200 years until two monks sponsored the construction of the buildings which make up some of the current monastery. Just transporting the materials for the next phase of building reportedly took 22 years! The path eventually opened up into a tidy courtyard with unhindered views in virtually every direction. On examining the buildings, they were in very good condition, which is a testament to the careful and thoughtful restoration that the monastic brothers have carried out over the years. Many of the original buildings date back to the 1500’s but you wouldn’t guess that by looking at them. The Katholicon is the name given to the part of the monastery used for services and the one here was built and decorated in about 1560. Walking into this is like walking into another world. It is dimly lit and all of the walls are painted with a dark background and countless frescos depicting scenes from the Bible and church history. The lives, deeds and martyrdom of long-dead saints and heroes of the faith are captured in stunning colour and exquisite detail in these 600-year-old visual records. The Katholicon is divided into several rooms, most with richly decorated domes and some with rows of rather uncomfortable looking wooden chairs running along the walls. Various podiums, altars, collections of church relics and other paraphernalia of the Greek Orthodox Church are placed throughout the building. This is a sacred and holy enclave and you cannot help the feeling that comes with being in a place where countless dedicated holy men have prayed for hundreds of years for God’s blessing and a better world. The massive 16th century barrel in the storeroom at first appeared to be a wine drinkers dream but was actually used for storing water because originally there were no water tanks. Twelve tonnes of fresh rainwater could be collected in this impressive tub. We next visited the Great Meteoron Monastery, which looks like it is “suspended in the air”, which is what “meteoro” literally means. This is the oldest and largest of the monasteries, being founded around 1340 and in the 16th century was the most powerful and influential of the monasteries. Now however it is occupied by just three monks. The old kitchen still contains the original bread oven and soup hearth, and the roof is black from hundreds of years of smoke. It was possible to get a sense of how spartan life was up here in the clouds back in the heyday of the monastic era. How peaceful, quiet and serene life must have been, despite a life devoid of creature comforts, especially during the harsh long winters. The old workshops contained a fascinating assortment of tools dating back hundreds of years, including wooden garden implements such as spades and forks, plus wine and olive presses and various barrels, jugs, bowls and ploughs. More recent additions include the ‘Martyrs Hall’ which celebrates church and Greek martyrs and a manuscript room which displays some of the many rare documents that date back to the 9th century. By the time we had enjoyed all that was on offer the day was moving on and the weather was closing in. There were other monasteries available to see, however our heads and hearts felt full to overflowing with what we had already seen and we decided to move on. Our next destination was Ancient Delphi with an overnight stay beside a fast flowing clear thermal stream at Thermopillion. That, however, is a story for another blog. When travelling for an extended period around such an amazing place as Greece, which has plenty to offer, you are often seeing sights and places every day that bring the word ‘WOW’ to your lips. Occasionally however, you happen upon a place where “wow”, even spelt in capitals, just doesn’t really seem adequate to convey the feelings of awe and wonder of experiences. For those times, we have our own word, which is “blabbage”. This is a word which has no English translation but for us it incorporates the feelings of ‘wow, amazing, unbelievable, how the hell did they do this, all rolled into one versatile word. Anyway if we say something is blabbage then you can rest assured that it’s the best of the best and has exceeded our wildest expectations and I hope that you grasp the sense of what this word means for us. So when I say that the place we visited today was given the title “Super Blabbage” then hopefully you appreciate how amazing it was! That’s the first time a super has been put in front of this word because it’s simply not been needed, until now. So what is this place that took our blabbage word to new levels of blabbageness? Before I tell you about our Super Blabbage place I need to go back a bit in time and tell you about some of the cool things we have seen on our travels. Amongst them are the various castles, fortresses, and archaeological ruins we have come across. When entering places like these we have a certain expectation of what will be seen before we set foot on the first ancient rock. If you have read our blog about the walls of Methoni then you will know what a cool place this was. Then there was Acrocorinth, again another amazing site. Delphi was also right up high on the scale of blabbageness however none of these were awarded the title “Super Blabbage”. The only place that has come close was the Meteora region with ancient monastaries perched high on towering spires of weathered rock. Monemvasia, is a small town in the municipality of Laconia, and includes the unique Venetian fortress/settlement on the island, which is connected to the mainland by a narrow causeway. At about 3pm on a beautiful sunny day we parked on the pier by the causeway, jumped out of Betsy, our lovely Motorhome and pointed our electric bikes towards the fortress on the island. I remember saying to Alan, “here’s another castle in the air”, meaning all castles are high and require considerable effort to hike up and see the ruins and piles of rocks that await us. Don’t get me wrong, I do actually enjoy walking around the rocks and thinking about those who used to live there, how they lived, what they looked like, what they dressed in, and what their way of life was actually like all those centuries ago. So by now its 4pm and the sun is still shining. We knew that tomorrow was due to be cloudy so taking photos with a blue sky trumps any other plans we [meaning I] might have had of relaxing after the drive down here. Across the causeway we rode. Passed the old stone buildings and around the access road while looking up at the shear red ochre stained cliffs with fortifications perched precariously on their edges and up to the fortress walls. Most of the archaeological sites and museums we visit close at 3pm in the winter months so we expected that we would arrive at closed fortress gates. Alan parked his bike and I stayed with them while he went to check out the timetable and costs for tomorrow so we could come back and explore. “You have to come and see this” I suddenly hear from an excited Alan, there are shops and hotels in there. Not really understanding what he was saying or what he saw we quickly locked the bikes together so I could take a squiz (a look for those non-Kiwis). This place was amazing! This place is Super Blabbage! It wasn’t just shops and hotels! It was an entire township with bars, cafes, and houses. While that in itself was amazing and unexpected, the rather special thing was the realisation that unlike virtually all of the other ancient places we had visited, this place has never been abandoned. We had suddenly been transported back hundreds of years to a long ago era. It took me back to the TV Series ‘Outlander’, (which we have been watching) where Claire found herself living in castles and visiting dungeons. Here we were, feeling the era, walking on the uneven paved and slippery stones under our feet. We were walking down the tiny walkways with stone houses and buildings on both sides, no place for Betsy on these roads. We could see the signature Venetian, Ottoman and Byzantine construction in the various buildings. How cool is this? The walkways went up towards the fortress and down towards the sea. We were like kids in a candy shop not knowing which way to turn next. What treasures would we see if we turned right, what would we see if we went downhill? It was all too much to take in with the timeframe we had and it soon became obvious that we would need to return tomorrow to absorb everything this place had to offer. We met a nice English couple from Bath who were also fellow sailors, and retired to their hotel for a few cold vinos and took the opportunity to take some snaps from their hotel room (above). The photo below is the lounge room of their hotel, check out the curved entranceway. The next day we were back, keen to soak up more of this amazing place. We popped our heads into the ancient churches. We walked down through a labyrinth of passages, through a hidden gate in the town walls and down to the waters edge. Here there are ladders luring holiday-makers into the crystal blue ocean to cool off from the summer heat. No temptation to us though as the March water temperatures aren’t very enticing. We traced Lower Town buildings right through to the outer eastern perimeter fortification, then ventured beyond what would have been the safety of these walls just a few centuries ago. Looking upwards there were multiple levels of houses and buildings. Their colours varied from the standard clay, brownish red, orange, blueish greys and of course stones with multi colours, all being built into a large rock cliff face below massive towering fortifications. Some of the newer buildings dated back only a hundred years or so, however, these appear to have been built around the ruins of old houses, churches and shops. These ruins are a constant reminder of the antiquity and history of the place. There are certain rules here. The words ‘rules’ and ‘Greece’ often don’t go together in a sentence but here there are rules. No plastic chairs outside, no satellite dishes or air conditioning units visible from the outer buildings, and no laundry hanging outside (the last one isn’t a bad rule, particularly for those looking out from above towards the ocean). And for the most part, people seem to, astonishingly, abide by these rules. Looking at our surroundings I felt like I was an intruder, like I shouldn’t have been here, but nevertheless this was a privilege to experience. This settlement has to be the best preserved we’ve seen anywhere in our travels around Greece and having arrived here in September we’ve managed to cover quite a bit of ground. We learned that the houses are two or three stories with a basement and tiled roof. At the lowest level, which is always vaulted, lie the cisterns for collecting rainwater and the cellars. The ground floor is used as a reception area and for the kitchen facilities. The family lives in the upper storey which is often a single space with many openings. The shop owners proudly showed off their handmade crafts, from oils, to olive wood carved goodies, to brass art, paintings, sculptures, and ceramic wares. Hotels, cafes, bars, restaurants and general tourist spots were aplenty, each having its own splendid view of the ocean and terracotta roofing tiles below. They receive their goods by wheelbarrow as the roads are too narrow for modern vehicles to venture. It must be a sight to see when someone moves in or out of these houses as the laneways are so narrow and the staircases so steep that one has to wonder how furniture was delivered. Perhaps it was built in place? Old olive trees were left undisturbed and were built around, clearly respected as important to the Greek culture. I found myself staring up at this settlement and feeling incredibly fortunate to be here and experiencing such a blabbage, woops I mean Super Blabbage, township. In past years its old inhabitants would watch out over the crystal clear Aegean Sea cautiously on the look out for the enemy, while feeling safely protected between the thick ramparts and the bosom of the cliff face. These days Monemvasia opens her doors to tourists by the bus load (and Motorhome load) that flock to this destination, just four hours south of Athens. If you find yourself in this region, Monemvasia is a must to visit and you can thank us later over a vino. Go to Caves of Diros they said. It’s un-miss-able! Located down near the southernmost tip of the Mani Peninsula on the Peloponnese, it was inevitable that as we tracked our way around the coast, we would eventually come across Diros. Provided that we didn’t cut east across Mani just before arriving in Areopoli. Arriving late in the afternoon we decided to explore the Caves the next morning. This gave us the opportunity to spend the night on a quiet, idyllic bay beside Diros with a large expanse of beach and land occupied only by us (and the rumbling pebbles being washed by the gentle waves). The thought of visiting caves took me back to the Waitomo Caves in New Zealand, with their stunning displays of glowworms. While Diros lacks the glowworms, it more than made up for it with the shear extent of the cave system and the amazing and varied stalagmite and stalactite formations. I didn’t know, without a bit of research, that the glowworms found in the Waitomo caves are the larvae of a species of gnat called Arachnocampa luminosa, which is unique to New Zealand. Well that explains why there are none here in Greece! Although Diros caves have been formed over the last 1.5 million years, the current locals have only known about their existence since the early 1900’s. That amazes me considering that this region has been continuously inhabited for thousands of years. The caves were not explored to any degree until 1949 and to date about 15 kilometres of the labyrinth has been charted. The majority of the cave system is actually below sea level with a maximum explored depth of 80 metres and stalactites discovered at a staggering depth of 71 metres. This wonderland was formed at a time when the sea was much lower than it is today. After navigating our way down the stairs through the small cave entrance, we emerged into a large open area lit with colourful lights and leading down to a line up of small boats on the still water. There now exists just one small accessible entrance to the cave network as all others have become submerged or have naturally closed up. Showing their high regard for safety, the officials have hung a buoy from one of the lowest hanging stalactites so we wouldn’t bang our head on it. Life jackets were handed out before being escorted onto a very small boat, if you could call it that – more like a raft with little sides (maybe that’s why they felt they needed to give us life jackets?). We were grateful to be here on a quiet day in the low season as the boats were set up to hold up to eight punters, which would have been a real squeeze, and I am sure that the boat would have been practically submerged. As it was, any movement by the passengers resulted in some serious rocking and listing and a stern warning from the boatman to stay still. Joining us were Eirini and Stavros, a young Greek couple from Athens who we had just met in the cave. Eirini is a lawyer working for a private shipping company, and Stavros a paramedic working in the private sector. They both spoke very good English, which was a nice relief, as in our experience, it is hard to find English speaking people around Greece. So with just four of us plus the boatman aboard, we were off to explore 1,200 metres of the watery cave known as the tourist route. The lighting in the caves is strategically positioned to capture the multitude of colours, shapes, and sizes of the elaborate limestone structures painstakingly fabricated by mother nature. The bedrock itself has its own range of colours changing from a dull green, to a slime coloured green, to greys, and then brownish reds. The largest and oldest stalagmites had discoloured to a brownish fawn shade, however, the newer ones were a lovely pale cream that glistened with moisture in the soft lighting. The still, crystal clear waters gave amazingly true reflections of the wonders above. Later, as we reviewed the photos we had taken, this played havoc with our eyes as we tried to reconcile which way was up. We came across masses of delicate thin stalactites hanging down like shards of glass congregated in a family circle. We were blessed with huge stalagmites as thick as ancient trees and spanning from the roof to the floor, standing proudly and stoutly as if they owned the place, which they probably did as we were told they were over a million years old. Then there were sheets of limestone, some that looked like thick large curtains – solid and stable, while others appeared to be frail sheets of paper. The caves were eerily still and quiet, at times opening out into large chambers with up to 17 metres of water below us then just as quickly shrinking down to a narrow crack with barely enough water to float the boat and a roof so low that even the shorter crew members had to duck. On closer inspection, and using one’s imagination, we could make out faces in the formations. A couple of the structures had been given names with one prominent rock known as the ‘lioness’, due to the strong likeness to the head of a lion without its mane. Can you make out the head of the lioness? Check out the size of this! Explorers and archeologists here have discovered the fossilized bones of panthers, hyenas, lions, deer, ferrets and the largest collection of hippopotamus bones in Europe. Remnants of pottery found at one of the old entrances points to occupation by early man thousands of years ago. Obviously this knowledge wasn’t successfully passed down through the generations. The chilly 14C water in the cave is brackish and apparently very hard, and the air temperature inside the cave ranges around a brisk 16-19 degrees centigrade. We were grateful to have chosen this particular day, 5th February 2018, for our visit as the previous day’s tours through the caves apparently lasted all of five minutes. This was due to the very low water levels, making most of the route impassable. It wasn’t clear what caused the change in water level as there had been no appreciable rain overnight and the tides around here are minimal anyway. We were treated to a forty minute journey through the caves, enjoying both wide spacious areas large enough to walk through or even kick a ball around, then we were ducking our heads to ensure we could get through. Next minute we were bracing ourselves for the bumps and bangs of our vessel as the boatman manouvered us around a tight 90 degree corner. In places we could see where some of the most ancient stalagmites and stalactites had joined hands making a solid column that appeared to be holding back the earth above us. The areas of deepest water in the caves were marked with orange/red floatation devices attached to each other with ropes and then to the cave walls. Finally the stalagmites and stalactites join up! Once the boat journey finished, we were free to step off and continue our cave exploration on foot. The lights once again were positioned to show mother nature’s handiwork in all its glory, as well as where we should be placing our feet safely. I couldn’t help but wonder about all those thousands of years these caves stood undiscovered, without being appreciated or enjoyed and it made me wonder how many more ‘Diros’ caves there are still waiting to be revealed. We have truly been blessed by the local Greek people whenever we have had interactions with them. They seem to love engaging with us, asking where we are from and showing their surprise at us traveling so far to visit their country. Sadly our experience at Caves of Diros also revealed another less endearing side to modern Greek culture where we experienced indifference and lack of consideration from our boatman. These guides are purported to have a guaranteed job for life and are very highly paid, by local standards, to provide the best experience for tourists. Unfortunately, this wasn’t to be the case from our guide. Although he could speak reasonable English he spoke virtually the entire commentary in Greek and offered no translation other than the odd word or phrase. While we understand that we are in Greece and can’t expect everyone to speak English for us, the other couple spoke good English and asked the boatman to speak in English so we could all understand. “It’s not my job” was apparently his answer. When Eirini then started to tell us in English what we were seeing, she was told to stop translating! After the boat tour ended, Eirini and Stavros were highly apologetic and embarrassed by what had transpired. They saw this as symptomatic of a deep problem in Greece today where many people are too lazy to do a good job and tourists are just seen as walking dollars (or Euros). They took it upon themselves to say sorry on behalf of the boatman and they were visibly ashamed about how we were treated. If Eirini and Stavros are typical examples of the young people growing up in Greece today then the country has a strong future, provided it can offer them enough incentive to stay rather than reap higher rewards for their labour elsewhere in the EU. Given this was one of the more expensive tours, at a cost of €26 (NZ$44) for two, the boatman’s behaviour and attitude was disappointing. However, one person having a bad day wasn’t enough to overshadow the great joy of experiencing this amazing and unexpected natural phenomenon and we highly recommend a visit to Diros Caves if you find yourself in this region. Soon after leaving Kalamata, we entered the land of the Maniots, the traditional inhabitants of Mani, which is the centremost of the three peninsulas which make up the southern part of the Peloponnese. Mani is a mountainous, rugged, semi-arid and hard land and many of the coastal villages were only accessible by sea until relatively recently. The Maniots are a proud and independent lot and were a source of constant problems for any power that tried to subdue and control them. 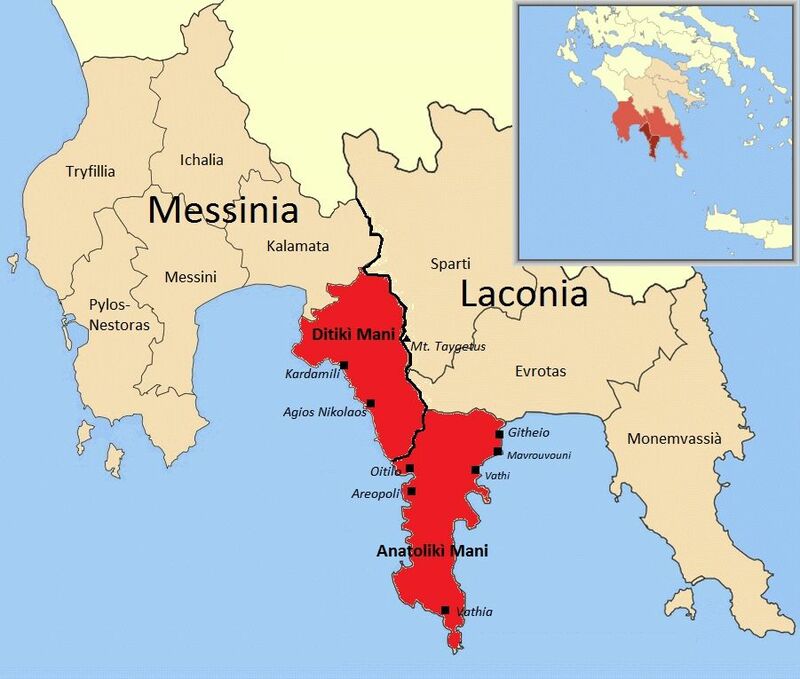 The Greek War of Independence (from the Ottoman Empire) originated in this area in the 1820’s and the locals swore a pact of “Victory or Death” which gives you an idea about what sort of the people they were. This independence and pride appears to be exemplified in the distinctly different architecture of the building here. In most other parts of Greece we have visited so far, many of the villages look run down, dirty and unmaintained. It is as if the inhabitants have been so weighed down by the Greek economic crisis that they have given up and allowed their surroundings to reflect their economic prospects. The Maniots on the other hand, seem to have looked the crisis in the eye, like they have done to previous invaders, and said “you will not change who we are, and we will be here long after you have gone”. Sure, there were still a fair number of totally derelict buildings, but this just seems to be the norm for Greece. Rather than tear down buildings once they reach a certain state of disrepair, they just leave them and build new ones alongside. This seems a little unusual for us who are used to a throw away society but it actually makes reasonable sense here, and this very practice means there are so many ancient buildings and sites that we can visit today. Derelict Buildings on Mani – tomorrow’s ancient sites? There was a very obvious change in the architecture of the buildings where suddenly nearly all of the houses, businesses and hotels, both new and old were constructed from beautiful local stone, with a similar design and obviously superb craftsmanship. Many of the building were tall, narrow, multi-story, rectangular and very symmetrical and some had battlements around the top edges or even small towers at the corners – almost like miniature castles. Stone of varying colour was used to create decorative effects. We soon learned that these were the ‘tower houses’, the design of which goes back to early Maniot history where every village was fortified, with every family house virtually being an individual fort. There is a strong and relatively recent history of ‘vendettas’ between Maniot families where after some real or imagined insult or incident, families would try to wipe out other families. These tower houses also gave protection and shelter in those times. The vendettas would often last until one family was either exterminated or left the area. It is certainly a different world to the one we grew up in. We passed some very impressive buildings giving an air of prosperity to the region, which may be a little deceptive. Like many coastal Greek areas, the economy relies heavily on the seasonal tourist industry supplemented by olive oil production and some other minor agricultural produce. There seemed to be little in the way of good arable land in the way that we would define it. Instead, the olive trees had to cling onto small patches of soil that had managed to accumulate on the steep rocky mountainsides. We had a pleasant night’s sleep parked by the Ionian Sea in the small seaside town of Agios Nikolaos, located just an hours drive from large town of Kalamata. Agios Nikolaus is sleepy in the wintertime but probably goes off in the high season. The people here were very friendly, as were some of the local cats. The seas were quite high from the steady on-shore wind which made for some great photos around the coast. It always seems a little hard to get moving early in Greece. Maybe it’s just because we are on holiday or possibly we can lay blame on the overall slow pace of life so the relaxed attitude of the locals rubs off on us. Anyway, by mid-afternoon we managed to get on the road again and pointed Betsy further south. As seems to be the norm when driving from coastal town to coastal town, the route first careens inland, taking you up some serious mountains with hairpin after hairpin before heading back to sea. The road width varies from very comfortable to ‘geez I hope we don’t meet anyone coming the other way’, and the road condition goes from almost immaculate to nearly falling apart. Scraping our way through the small villages normally produced some of the most interesting moments of the day where a road originally made for single file donkeys now has to accommodate whatever modern vehicles come along. In many cases these tracks between the old houses are virtually single lane and there is absolutely no way two vehicles could pass without some serious manoeuvring. Fortunately, the locals are incredibly relaxed about this and no-one seems to get upset. I guess you just grow up here accepting that it is how it is and sometimes you have to make allowances. The biggest wow moments came when we were able to find somewhere to pull over and investigate a few of the many ancient Byzantine era churches dotting the landscape. We will share more about these in another post but it is fair to say that we had some seriously jaw-dropping moments. Fish is a staple part of the diet around this region and we try to buy it fresh whenever the price is right and quality looks good. When we rolled into Neo Italio we saw what looked to be someone selling fish from outside a restaurant. Smelling a good deal for something fresh we stopped and investigated. It turned out that the fish belonged to the restaurant and we could buy what we wanted and they would cook it or they would sell it to us whole and we could take it away. That all seemed fine until the takeaway price for a modest one kg fish of 30 Euros was quoted. Too rich for our blood and the obvious lesson learned is not to expect a low price if you buy from a restaurant (obvious duh!). Never mind, we had a light dinner in the restaurant anyway and spent a quiet night parked on the road outside. Interestingly, if you were to come here in summer, the area we parked on is covered over with platforms and seating for the restaurants. Bad weather can be the difference between staying in one place for a while or moving on quickly. No place looks inviting in a howling gale. With rain looming, grey clouds overhead, and a cold wind blowing who wants to get out and explore? It’s just too easy to sit inside and watch movies or read a book with a blanket wrapped around your legs for warmth and comfort, and the smell of hot coffee brewing nearby. Yet when the sun is shining, the weather calm, and the ocean glistening with encouragement trying to entice you in for a swim, your spirits are lifted and you feel happy without really knowing why. That’s when it is easy to motivate yourself to inhale the sights, sounds, and mysteries of your new surroundings. As a traveler, this type of weather makes you want to get out on foot, or bike and soak up everything your new location has to offer. That’s when you think, ‘what will we discover here, or ‘how did people live thousands of years ago’ and ‘how do the locals feel about what we are experiencing today’. In seven months we had experienced just seven days of bad weather that stopped us from venturing out and exploring the mysteries of Europe. Little did we know what was to come. On 18 January 2018 we found ourselves in the quaint historic seaside village of Pylos (also spelt Pilos) nestled in the southwest corner of the Peloponnese region of Greece. We tend to gravitate towards water, rather than mountains, and found ourselves once again in a harbour township. The first night we parked in the prime spot at the end of the pier and were spoilt with tranquil water views of the Ionian Sea and magnificent vistas of the numerous islands surrounding this picturesque little town. We were in good company with three other motorhomes parked alongside us, one of which we followed for several miles into Pylos with obviously the same “Park for Night” (an app designed for motorhomes to find safe and usually free parking) location beckoning them. Once parked, it’s customary to say hello to the neighbours and introduce ourselves, and to make it very clear that they know we are from New Zealand(! ), not from France, as the number plates would have you think. Despite New Zealand decals in bold black lettering on the front and rear of Betsy (our Motorhome), and the obvious ‘NZ’ stickers strategically placed on her exterior, people look past these clear signs and go straight for the number plate to determine the driver and co-pilot’s nationality. Before long we were invited to dinner that evening at a local waterfront restaurant, Poseidonia Cafe and Restaurant, which had been previously scouted out by Katherine and James, hailing from Bristol in the UK. Katherine determined, correctly, that an earlier restaurant in Pylos she’d investigated offering chicken nuggets and chips wouldn’t be up to scratch. Besides, Poseidonia Café also kindly tolerated dogs accompanying their owners while enjoying dinner. (I must say that not being a dog owner or admirer, the idea of having three dogs join us for dinner didn’t delight me much). To their credit and that of the owners, we never heard a sound from any of the dogs and there was, thankfully, no dog seen to be begging for food or being fed from their owners or other patrons. Walking back to our motorhomes, wrapped in gloves, hats, scarves, and of course, warm jackets to keep the whistling cold wind from hitting our exposed flesh, a comment was made that we should have a shared dinner tomorrow evening. Having skited about Alan catching and us both cooking calamari a couple of weeks previously, I was tasked with cooking stuffed squid for eight people as the main dish. Arrgh, me and my big mouth! It sounded like a fine idea after a couple or three wines, until the next day when I was reminded of my offer. Heading back to Betsy, the wind by this time had swung around, causing our bike bag that covers the electric bikes on the back, to noisily flap around in the wind. Given this is right beside our head when in bed, Alan very quickly repositioned Betsy so we were nose into the wind and could sleep comfortably without earplugs. The next day dawned fine but windy and we were off exploring Nestor’s Palace with our newly acquired Swedish friends Hakan and Helena in their motorhome (good thinking Ruth – giving Alan a day off driving). Later that day it was time to get ready for dinner and stuffing eight individual calamari was my next chore. Luckily I enjoy cooking and it was more pleasure than pain, especially when looking forward to the ooohs and aaahs of adoring diners. Tummies stuffed with great home (or motorhome) cooking, it was time to head back to our respective abodes. Upon exiting, Mick (Sue’s husband) shared that the wind was expected to blow tonight. I remember thinking hasn’t that been happening all day? Then, with that knowledge, I looked out onto the harbour rather thankful we were in a motorhome, and not on a yacht. Past memories came flooding back of clanging and banging rigging on boats and being rocked from side to side enough to stop one from sleeping. I remember thinking thank goodness Betsy is a solid motorhome on firm ground. Or was she? We tucked ourselves into bed, listening to the gentle wind blowing outside. Alan’s reparking of Betsy yesterday set a trend and our neighbours had now reparked with their noses into the wind. This was, or so I thought, going to be another night of no earplugs required as we drifted off into a peaceful slumber having enjoyed the rare pleasure of other people’s company both during the day and of course, the shared decadent evening meal. CRASH! It is 1am. BANG!! What on earth was that? We were jolted awake by fierce winds howling outside our bedroom window, screaming like a cat on heat. Betsy was swaying – were we in a boat or a motorhome? The wind was trying to push us over, of that I was sure. It blew and blew and Besty held her ground while I held my breath wondering which gust was going to send us on our side. Each gust seemed to be building upon the one before it and Betsy was struggling to hold her ground. I’m praying that there is something to be said for being of wide girth (sorry Betsy, we love you). However, the wind didn’t relent. Not only did it slam into us, but it was now also pushing water from the harbour right to our door – literally! Our tyres were surrounded by seawater – what the heck?! We are, or at least were when we went to bed last night, on dry land. So much for a night without earplugs! In went the plugs as I knew there was nothing we could do in the middle of the night in a raging storm. Moving location in these conditions is asking for trouble and there was no way we were going to have Betsy side on into these huge gusts. That would be giving into the wind as she would most definitely topple over. It was all we could do to hold on and hope for the best. This was the first time in many weeks that we had encountered other motorhome travelers, and given our circumstances (thanks to the raging storm outside) I was thankful for the thought of safety in numbers, even though we were all in the same boat, so to speak. Why we stayed parked up on the wharf in Pylos overnight is anyone’s guess. Knowing the wind was going to increase, none of the five couples in neighbouring motorhomes (many with more experience than us) expected the wind would rage uncontrollably and dump tonnes of water on us and them. The noise was like a freight train with nowhere to go and no goal other than to offer a disturbing and frightening night, which it did with ease. Having been a sailor in a previous life, the motorhome felt like we were at anchor in a storm, being thrown from side to side trying to loosen our grip on the firm ground. Thankfully I didn’t have to get up to see if we were dragging our anchor. The wind increased, we estimate to about 60 knots by the morning, and we watched the water encroach where it shouldn’t, namely around our and on top of other people’s motorhomes. The wind didn’t let up and tormented poor Betsy all night and was still at it when the sun decided to raise its head in the morning. Morning finally came, and we endured the plummeting for a short while longer, before relocating to a safer, and dryer position on the other side of the pier. It was then we could see the extent of what we were feeling during the night. Huge waves came in, over, and on top of the campervans to our port side, crashing down on their roof. Thankful for our position further west, we were still not without the dangers, and I took a video to show what we woke to. Now the sun was up and we could see it was time to run for shelter like a yacht in a storm. Betsy put her tail between her legs and Alan helped her to high-tail it out of the storms fury but only after we felt safe enough to leave. Looking around, we could see one of the party of four, had already made a run for it and had repositioned their motorhome. Smart thinking. By about 10am the wind calmed down and I was afraid I’d lost the opportunity to capture stunning photos. I need not have worried. Soon it roared up again to a now estimated ferocious seventy plus knots. These photos and videos don’t give the true sense of just how hard it was to stand up, or the roaring sound of that freight train we were hearing which was almost deafening at times. The roads of Pylos being hammered by the waves which also towered above and crashed down on to the three-story houses! Now we were safe, it allowed me to think of others and I felt sorry for those in the homes opposite the waterfront where the waves were crashing on the road and wondered how often they endure these seas; was it a usual occurrence, or was this one out of the box? We walked over to the shops where a retailer told us she hadn’t seen this sort of weather for five years. Then we noticed the locals stopping their cars, literally in the middle of the street (as they do in Greece), and taking photos of the crashing water, before moving on. That told the story of the storm’s rage. Don’t Rent a Boat today! It was time for us to move on and later that day (after Alan washed the van down with fresh water twice to try and remove the salt), we headed further down the Peloponnese coast to Methoni, just a short drive away. Hoping to find more shelter, we went for a walk up the impressive 600-year-old castle and were astonished to find waves crashing some fifty-foot high into the ancient castle frontage! Here the wind was so strong that I ended up sitting down, as I could hardly stand against the pummelling. But this was not before the wind literally blew off my woollen All-Black’s beanie from my head and sent it over the cliff. I resisted the urge to go after it, or to look over the fifty-foot cliff and see where it landed in case the wind took me there too. I’m happy to say that the next day, with the weather and seas much calmer, we walked to the base of the cliff and Alan found my hat, a little worse for wear with a couple of holes in it. Thanks to a local seamstress in Kalamata, our next stop, it has now been repaired and is back to full working order. Having experienced a once-in-a-lifetime raging storm, we were thankful for the opportunity to snap fabulous photos and share them here. That way you won’t have to wait for the five-year timeframe or the frightening freight train in the middle of the night to see how beautiful mother nature can be in all her fury.